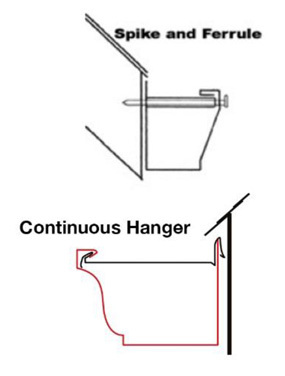 PRO FORM uses a continuous hanging system with self-sealing installed approximately every two feet. This sturdy hanging system is the only acceptable for homes. The T-Rex makes your rain gutters stronger. Support the weight of snow, ice and ladders. 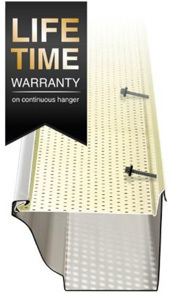 With the T-Rex continuous hanger, your rain gutters are reinforced from end to end. There are no weak points. It can even hold the weight of three people. Dirt, dust, roof tar and environmental polluants are regularly deposited onto your eavestroughs. When it rains, these impurities are absorbed by the rainwater, which then drips onto the visible part of the eavestrough. The drip edge channels dirty water directly to the ground, rather than along the rain gutter itself. The drip edge prevents the formation of unsightly dark lines that can be seen from ground level. Keeps water inside the rain gutter during heavy rains. The perforated T-Rex system efficently drains large quantities of water, without overflowing. A leaf guard with larger holes allows a large quantity of debris to enter the eavestrough. SNOW AND ICE REMAIN ON TOP OF THE PRODUCT. Your eavestroughs will drain normally when it rains or the weather warms up. Protects against expansion caused by snow and ice thawing and freezing inside of the rain gutter. PREVENT WATER INFILTRATION CAUSED BY ACCUMULATED DEBRIS AND ICE. In summer: When a rain gutter is clogged with leaves and debris, water cannot drain and automatically goes back toward your home or falls to the ground. Water will inevitably leak into roof and foundations. T-Rex prevents leaves and debris from clogging the eavestrough, keeping water from seeping into your home. In winter: T-Rex helps rain gutters function normally throughout the year. An eavestrough that is clogged with snow and ice cannot work. When it rains or the weather warms up, water will seep into the house since it cannot be drained by the eavestrough. The T-Rex continuous hanger hides the interior of the rain gutter. When seen from inside the home. What’s more, spikes fastenings are visible from the ground and can rust over time. Also, the T-Rex M-5200 comes in colours that match the colour of your rain gutter, improving its appearance, whether seen from the ground or from inside your home.